Kevin Stanton is chief services officer at Mastercard, responsible for the company’s overall global strategy for Services which includes Loyalty & Managed Services, Data & Analytics, APT, Advisors Consulting Services, and the services vertical organizations (Financial Institutions, Retail & Commerce, and Government & Development). Kevin serves on the company’s management committee. 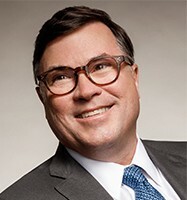 In his previous role, Kevin was the president of Mastercard Advisors and prior to joining Mastercard Advisors in 2010, Kevin served as president of the company's Canada region for six years. During this time, he initiated its evolution from a credit company to a payments company, establishing Mastercard as the fastest growing payments brand in Canada. In previous Mastercard roles, he served as senior vice president, strategy and market development for the Canada Region, and vice president, senior counsel and North America region counsel. Before joining Mastercard, Kevin practiced law as an associate in the banking divisions of a number of leading Boston law firms. Kevin holds a J.D. from Tulane University School of Law, and a Bachelor of Science in Anthropology from the University of Massachusetts at Amherst. He is a supporter of Toronto's Hospital for Sick Children and sits on the boards of The Royal Conservatory of Music and Royal St. George's College. Kevin also is a member of Program Advisory Board, Master of Management Analytics, Queens School of Business.